Legislation currently being considered in Illinois would amend the state constitution to allow for a graduated-rate individual income tax. Plans being discussed would move Illinois from a single rate tax to a graduated rate structure with top rates ranging from 8 percent to 11 percent. Sixty-one percent of employers in Illinois are pass-through entities, meaning they pay business taxes through the individual income tax. Implementing the graduated rate structure would increase taxes on many of these businesses. On average, 38 percent of employment at businesses with at least one employee are pass-through entities in Illinois. Share of pass-through employers varies based on industry, with the highest concentration occurring in the construction sector. Other highly-impacted industries are professional, scientific, and technical services; agriculture, forestry, fishing, and hunting; administrative and support and waste management services; and real estate and rental and leasing services. Pass-throughs tend to be smaller in size, with the majority of pass-through employers employing less than ten people. Small businesses’ performance in Illinois has lagged when compared to the rest of the country, and hiring prospects have worsened since last year. The Illinois economy is underperforming in comparison to other states in the region and the country as a whole. Experts express caution over using taxes as a solution to the state’s large and rising pension debt. Legislation currently being considered in Illinois would amend the state’s constitution to allow for a progressive individual income tax. Main rate structures being discussed would institute top rates ranging from 8 to 11 percent. A large share of Illinois employers would be impacted by this tax legislation, since 61 percent of employers in the state are pass-through entities. This includes a large number of small businesses and firms in several of the state’s key industries. This report details how various industries and Illinois’ business tax landscape will be affected by proposed legislation. The Illinois General Assembly is currently considering legislation that would amend the state constitution to allow for a graduated rate individual income tax, which the constitution explicitly prohibits. Illinois’ current individual income tax is a single rate of 5 percent on all incomes. The rate is scheduled to decrease to 3.75 percent in 2015 if a set of temporary tax increases passed in 2011 expire as planned. The first plan under consideration is one proposed by Representative Naomi Jakobsson which would institute a top rate of 9 percent. Another put forth by the Center for Tax and Budget Accountability (CTBA) would increase the top rate to as high as 11 percent. The final proposal, released by House Speaker Michael Madigan, would impose a 3 percent income tax surcharge on taxpayers with incomes over $1 million. Table 1 below compares the three plans with current Illinois law. Source: Commerce Clearing House; Illinois Policy Institute; Center for Tax and Budget Accountability; 98th General Assembly of the State of Illinois. A pass-through entity (also referred to as a “flow-through”) is a business that does not pay business taxes via the corporate income tax. Earnings are “passed through” to the individual owner or owners of the company, and taxes are paid through the individual income tax. Examples of pass-through entities are sole or individual proprietorships, partnerships, and S corporations. These types of employers make up a significant proportion of the Illinois economy. According to data from the U.S. Census Bureau, approximately 61 percent of Illinois employers were either sole proprietorships, partnerships, or S corporations in 2011. Figure 1 below provides a breakdown of the legal form of organization for employers in Illinois. All three income tax plans would increase rates on many of these pass-throughs, as many fall in the higher income brackets of a graduated income tax. These rate increases would translate into higher tax liabilities for businesses and make it more difficult for them to expand, hire more workers, or retain existing workers. These businesses subject to the individual income tax tend to be smaller, on average. For example, 93 percent of individual proprietorships with employees in Illinois have less than ten employees, while 63 percent of partnerships with employees have less than ten employees. The majority of S corporations with employees also have ten or fewer workers (80 percent of total). It is important to note, however, that small businesses and pass-through entities are not one and the same. Some small businesses are classified as C corporations, and some pass-through entities (albeit a small number) employee large amounts of people. For example, 63.2 percent of employer C corporations in Illinois (what most people think of when discussing traditional “corporations”) have less than five employees. [w]hile a dearth of fast-growing startups has weighed on job creation nationally, in Illinois the weight is especially pronounced as entrepreneurs worry that they will end up inheriting the state’s financial problems and have to help pay for them. Small firms seeking a stable environment are looking elsewhere to set up show or expand. In a 2013 survey of Illinois small businesses with annual revenues of $10 million or less, 67 percent of owners within the state indicated that the conditions for small businesses in Illinois were worse than the rest of the nation. The top reasons behind their choice were “higher taxes” and “poor government planning.” In a similar survey, Illinois small business owners indicated that only 30 percent intended to hire another worker or workers in the next six months, which was a decrease of 10 percentage points from last fall’s poll. The share of pass-throughs by industry varies. On average, 61 percent of employers in Illinois are pass-through entities. Table 2 below lists the share of each industry’s employers that are pass-throughs for Illinois’ private sectors. Thirty-eight percent of jobs at businesses with at least one paid employee occurred at pass-throughs in Illinois in 2011, which is a sizeable share of the state’s workforce. Table 3 below lists the percentage of each sector’s employment at businesses with employees that occurred at pass-through entities. Columns may not sum to total due to rounding. Only includes establishments with at least one paid employee (excludes nonemployer businesses). (a) Indicates approximate value (data was excluded for confidentiality reasons, though percentage can be approximated). Source: U.S. Census Bureau County Business Patterns, Bureau of Economic Analysis Regional Economic Accounts, Tax Foundation calculations. Data excluded for confidentiality purposes. (b) Indicates large portion of data excluded for confidentiality purposes and total pass-through percentage is understated. Those sectors of the economy with a high concentration of pass-through entities would be impacted more severely by the income tax rate increase than others. Table 4 below lists the most disadvantaged industries. Illinois construction sector payroll is underperforming when compared with national growth trends. The industry has also shown negative employment growth in the last six years, while the state economy only saw negative employment growth during peak recessionary years. Industry employment is projected to decrease in 2014. Though the decrease this year is expected to be smaller than last year’s, the construction industry has the worst employment growth projections out of all other industries over the next five year period. Construction’s share of private real state GDP has also decreased over time. In forecasts of the state’s long-term economic future, the high-tech services industry has been cited as source of future state growth. This industry’s employment is at the highest level it has ever been, and jobs in the subsector are high-paying. Real state GDP for legal services was severely impacted during the peak of the recession in Illinois and saw negative growth the next two years (the only subsector in this industry that had negative growth during these years). The administrative and support services sector is expected to be “a significant source of new jobs as more expansionary businesses seek out temporary help to meet demand.” The industry saw a sharper contraction in real GDP during the peak of the recession, but is now performing better in terms of growth than the U.S. average. This is Illinois’ largest sector. Both residential and commercial real estate have already seen weak growth but are finally on the path to recovery. This trend has resulted in lower employment in housing construction. Despite the fact that employment related to housing is no longer decreasing, its growth is lower than the U.S. average and the Midwest average. The story is similar for commercial real estate, though the sector is forecasted to improve, albeit at a lower-than-average rate. The transportation and distribution sector, like the tech industry, was also predicted to be an industry that would propel future state growth. Industry employment grew faster than average in recent years. Positive employment growth is expected in the near future, but this trend is forecast to turn negative in subsequent years. Illinois was impacted more severely by the most recent economic downturn than the rest of the country and the region. It has only recovered approximately two-thirds of employment lost during the recession. In contrast, both the Midwestern region and the country as a whole have recovered more than that (75 percent and 85 percent, respectively). Rick Mattoon, a senior research economist at the Federal Reserve Bank of Chicago, pointed out at the beginning of this year that the state “continues to underperform the nation in the current recovery” and that “[u]nemployment stays high and growth is low.” He also noted the economic drain from fiscal uncertainty since businesses were unsure what the state’s tax structure would resemble in the future. In state economic forecasts prepared by Moody’s Analytics for the State of Illinois Commission on Government Forecasting & Accountability, the tone was cautionary but optimistic. Though the state has seen weak growth comparatively, and there are prospects for improvement, there is also still cause for concern. For example, one report found that among other Midwestern states, Illinois was ranked in the bottom third when measured on output, income, and employment in 2013. Similarly, Illinois’ unemployment rate is tied with Nevada for the second highest in the nation at 8.7 percent as of January 2014. This is well above the U.S. average rate of 6.6 percent. now that [pension] debts must be repaid, tax burdens will possibly rise above the national and regional norms. Accordingly, a potential downside is a dampening of growth and development as rising taxes, without any accompanying rise in services, diminishes the attractiveness of investment and livability in the state…[This] would likely exercise a moderating overall influence on growth and development. Illinois lawmakers are considering moving the state’s income tax system from a flat rate on all income to a graduated rate system with top rates ranging from 8 to 11 percent in 2015. This tax change would impact a large share of Illinois employers because many are pass-through businesses which pay taxes via the individual income tax rather than the corporate income tax. Two amendments are under consideration, the first being HJRCA0033. See 98th General Assembly of the State of Illinois, House Joint Resolution Constitutional Amendment HC 0033 (HJRCA0033), http://www.ilga.gov/legislation/98/HJRCA/PDF/09800HC0033lv.pdf. HJRCA0033 does not include a set rate structure and would take effect upon adoption (after November 2014 and would apply to tax years 2015 and after). Publicly discussed rate structures associated with amendment include one proposed by Rep. Naomi Jakobsson and one proposed by the Center for Tax and Budget Accountability. The second amendment being considered is HJRCA0051. See 98th General Assembly of the State of Illinois, House Joint Resolution Constitutional Amendment 0051 (HJRCA0051), http://www.ilga.gov/legislation/98/HJRCA/PDF/09800HC0051lv.pdf. HJRCA0051 is retroactive to January 1, 2014 and would apply to tax year 2014 and after. Ill. Const. art. IX, § 3, pt. a, http://www.ilga.gov/commission/lrb/con9.htm. Illinois Public Act 096-1495, enacted in 2011, temporarily raised individual income tax rates from 3 percent to 5 percent for 2011 through 2014. It lowered rates to 3.75 percent for 2015 through 2024 and to 3.25 percent in 2025. See Illinois Public Act 096-1495, § 201(b)(5), (5.1)-(5.4), http://www.ilga.gov/legislation/publicacts/96/096-1496.htm. The Illinois Policy Institute published email correspondence with Rep. Jakobsson last fall asking her to confirm the details listed in Table 2. She confirmed that these rate structures were correct. These are the only details known about this particular plan. 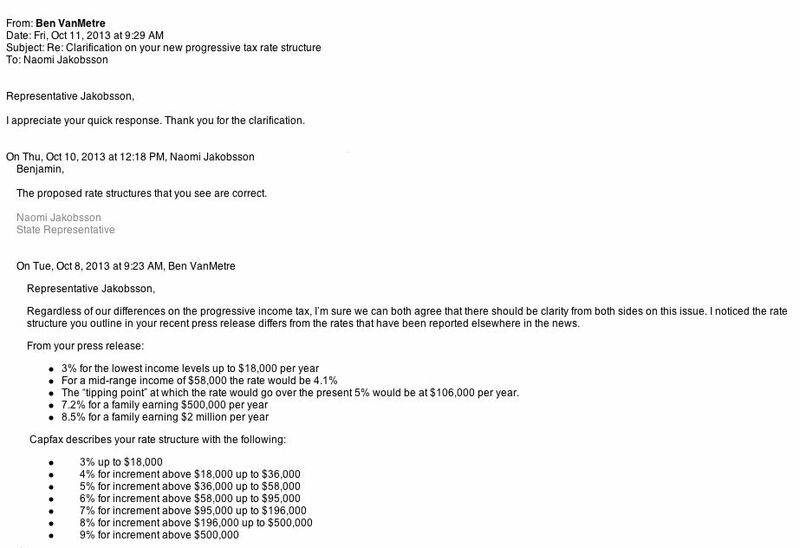 See Email from Representative Naomi Jakobsson, Illinois House of Representatives, to Benjamin Van VanMetre, Senior Budget and Tax Policy Analyst, Illinois Policy Institute (Oct. 11, 2013, 09:29 EST), available at http://illinoispolicy.org/wp-content/uploads/2013/10/progressive-tax1.jpg. Center for Tax and Budget Accountability, The Case for Creating a Graduated Income Tax in Illinois (Feb. 2012), http://www.ctbaonline.org/sites/default/files/reports/ctba.limeredstaging.com/node/add/repository-report/1385494205/R_2012.02_CTBA%20Graduated%20Income%20Tax%20FINAL%20Report%20Feb%202012.pdf. Commerce Clearing House, State Tax Smart Charts, Illinois Personal Income Tax, 2014 Tax Year. Assumes rate drops as scheduled. U.S. Census Bureau, 2011 County Business Patterns: Geography Area Series: County Business Patterns by Legal Form of Organization, http://factfinder2.census.gov/faces/tableservices/jsf/pages/productview.xhtml?src=bkmk, 2011 Business Patterns [hereinafter County Business Patterns]. “Employer” here is defined as businesses with at least one paid employee, as designated by the U.S. Census Bureau. “Other” category includes nonprofit institutions, government, and other legal forms of organization, as designated by the Census Bureau. Moody’s Analytics/Economic & Consumer Credit Analytics, State of Illinois Economic Forecast, prepared for State of Illinois Commission on Government Forecasting & Accountability (Feb. 2014), at 4, http://cgfa.ilga.gov/Upload/2014-FEB%20Moodys-Economy.com%20IL%20FORECAST%20REPORT.pdf [hereinafter 2014 Moody’s Economic Forecast]. 2014 Moody’s Economic Forecast, supra note 10, at 14. U.S. Bank, 2013 Small Business Annual Survey, Fourth Edition (Apr. 2013), at 4, http://www.usbankconnect.com/files/tools/2013%20U.S.%20Bank%20Small%20Business%20Annual%20Survey%20Complete%20Results.pdf. Kevin P. Craver, Small business owners to sound off on salary report, Northwest Herald, Nov. 10, 2013, http://www.nwherald.com/2013/11/08/small-business-owners-sound-off-on-salary-report/ad8h2lc/?page=1. This analysis focuses on employer businesses (defined as businesses with at least one paid employee) rather than nonemployer businesses. See U.S. Census Bureau, Nonemployer Statistics, https://www.census.gov/econ/nonemployer/. In general, nonemployer businesses tend to have an even higher share of pass-through entities (for example, this category would include self-employed contractors). Thus, the estimates of concentration of pass-throughs in each sector found here are lower-bounds; including nonemployers would increase overall shares dramatically. County Business Patterns, supra note 8. This employment measure does not include nonemployer businesses such as self-employed individuals. 2014 Moody’s Economic Forecast, supra note 10, at 54. 2014 Moody’s Economic Forecast, supra note 10, at 56. Bureau of Economic Analysis, Real GDP by state (millions of chained 2005 dollars), Illinois, Regional Economic Accounts (1997 to 2012), http://www.bea.gov/iTable/index_regional.cfm [hereinafter Real GDP by State]. 2014 Moody’s Economic Forecast, supra note 10, at 17. 2014 Moody’s Economic Forecast, supra note 10, at 7. Real GDP by State, supra note 23. 2014 Moody’s Economic Forecast, supra note 10, at 19. 2014 Moody’s Economic Forecast, supra note 10, at 14, 39-40. Rick Mattoon, The Economic Outlook for 2014—U.S. and Illinois, Federal Reserve Bank of Chicago presentation at the Illinois Financial Forecast Forum (Jan. 31, 2014), at 10, http://www.cgsniu.org/Financial_Forecast_Forum/Presentations/Mattoon.pdf. Moody’s Analytics / Economic & Consumer Credit Analytics, State of Illinois Economic Forecast, Prepared for State of Illinois Commission on Government Forecasting & Accountability (Jan. 2013), http://cfga.ilga.gov/Upload/2013MoodyEconomyILforecast.pdf. See also 2014 Moody’s Economic Forecast, supra note 10. 2014 Moody’s Economic Forecast, supra note 10, at 1. Bureau of Labor Statistics, Unemployment Rates for States, Local Area Unemployment Statistics (Jan. 2014), http://www.bls.gov/web/laus/laumstrk.htm. Press Release, Bureau of Labor Statistics, The Employment Situation—January 2014 (Feb. 7, 2014), http://www.bls.gov/news.release/archives/empsit_02072014.pdf. Bill Testa & Thom Walstrum, Will Efforts to Fix Illinois Budget Hamper Economic Growth? Bill Testa on the Midwest Economy blog, Federal Reserve Bank of Chicago, Apr. 11, 2013, http://midwest.chicagofedblogs.org/archives/2013/04/illinois_public.html.